As you’ve probably noticed I haven’t been posting articles for a bit – which is a good sign I’ve been drawing other projects. Anna Brones and I have now almost finished our first draft for our book (scheduled to be published in Spring 2015). So if I haven’t been in the kitchen developing recipes I’ve been at my drawing table drawing them (or on a ladder patching and painting walls for my new home). In late July the book “The Culinary Cyclist” by Anna Brones was published. The book is illustrated by me and it’s for sale here in my SHOP. I also have many other drawing projects that I will share with you when the time is right. Autumn is here and I don’t know about you but I think its a perfect time to crawl up on the couch with some cookies and a book. Turn the oven on to 350°F (175°C). Toast the hazelnuts in a skillet. Blend them roughly in a food processor (or chop them into tiny pieces). 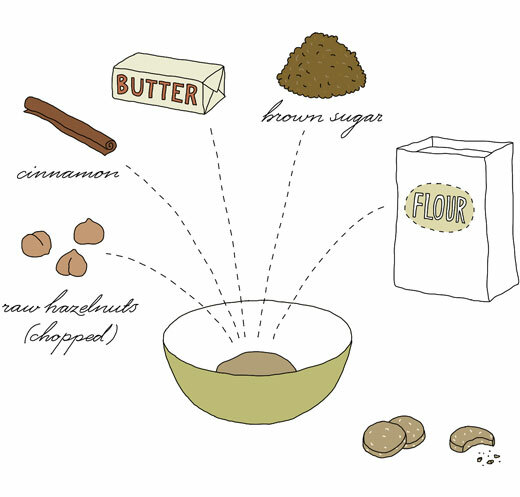 Mix together hazelnuts, sugar, butter, flour and cinnamon in a wide large bowl or directly on top of the counter. 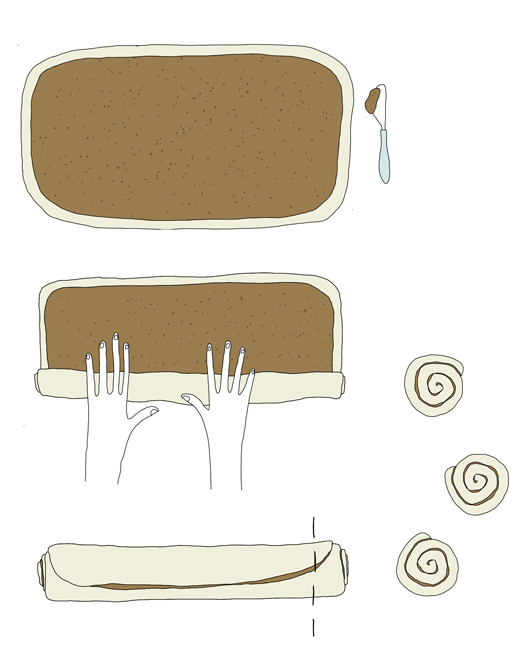 Work all quickly together with your fingertips (or with a knife) into a dough. Form two separate 7″ long rolls, about 1″ in diameter. Let the dough rest in the fridge for at least 30 minutes. With a sharp knife, cut about 18-20 slices to each roll. Bake for 12-15 minutes or until they are a nice color. Let the cookies cool separately from each other on a flat surface before storing them in sealed containers. The cookies can also be stored in the freezer. My next guest here on kokblog is my brother Oskar Kindvall. Oskar is probably one of the biggest gottegris (directly translated to ‘sweet tooth pig’) I know. As long as I can remember he has been very specific with sweet (and savory) things he likes and desire. For birthdays and Christmas he wished for marzipan and olives while I was dreaming of a new barbie doll or drawing equipment (yes that was a passion already then). Oskar was born in Valencia when my parents lived in Cullera, a small town by the east coast of Spain. This must obviously have had a great impact on his interest in Spanish treats (see below). During a journey we made together in the late 80’s, I remember him carefully mapping out where the best flan was made. He of course returned later to the very best. He also makes excellent paella all year around in his garden. A skill he learned from our mother and father. From an early age Oskar also developed a huge interest in nature and especially small creatures such as frogs, beetles and later on birds, grasshoppers, bats and butterflies. Like his passion for sweet treats, this interest never stopped. Today he works as an IT Developer, researcher and environmental analysts at ArtDatabanken, Uppsala, Sweden. I’m not surprised that he has become an associate professor of ecology as for me he was a professor long before he reached university. When traveling in Mediterranean parts of Europe I have adopted a peculiar obsession for fried pastries. My favorites among these delicious pieces of edible art are the donut like creations called Xuxos. These can be found in north eastern Spain and Southernmost parts of France. When made by experienced hands according to the tradition at local bakeries, there is almost nothing that can stop my appetite for them, except for one more of them. The really good ones are quite big, stuffed with tasty vanilla cream, extraordinary greasy and full of sticky sugar all over which make them both a little bit hard to handle and extremely calorie rich. Usually you are quite full after one of them which is so frustrating. For obvious reasons I have tried to make my own xuxos. However, even if my attempts have been really tasty most of the time, I still have not revealed the secret the experienced traditional bakers possess. I realize that it is time to make a visit behind the scenes of the bakery next time. Especially since the handmade Xuxos have become increasingly hard to find nowadays. In most areas where I used to find good Xuxos almost everywhere in the early 80’s, it seems that they have been totally outcompeted by machine made copies with no magic. It appears to me that the negative trend has been worse in France while really good xuxos still can be found around Barcelona. 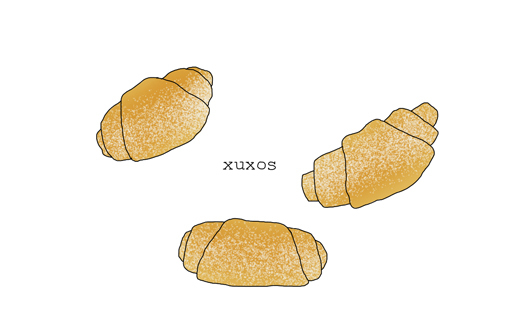 Someday I hope to meet someone who can show me how real xuxos should be made. 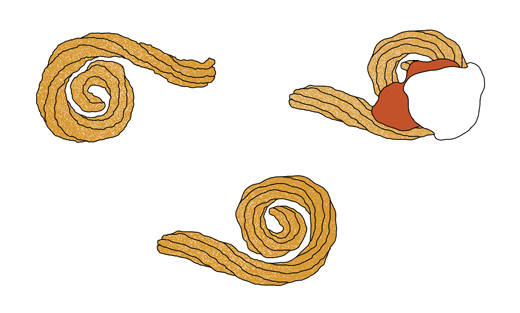 Meanwhile I enjoy baking another fried pastry, called Churros, which is much easier to bake without much experience. Churros can be found almost everywhere in Spain and southern France and very often you can watch the whole baking procedure while waiting for your order. Besides, there are a lot of recipes on the internet. No secrets, not much magic but still very tasty! Most churrerias serve the newly baked churros on a plate together with sugar and chocolate. Personally, I recommend eating them with whipped cream, strawberry jam and a little sugar on top. However, this combination I have never seen at the Spanish churrerias. As a consequence you have to make them yourself to really enjoy their potential. It’s Fat Tuesday (12 February 2013) and Scandinavians celebrating this day by eating Semlor (Fastlagsbullar or Fettisbullar). This semi-sweet cardamom rich bun is filled with almond paste and heavy whipped cream. My Finish grandfather used to eat this bun soaked in hot milk, which is still a common way to enjoy this bun. 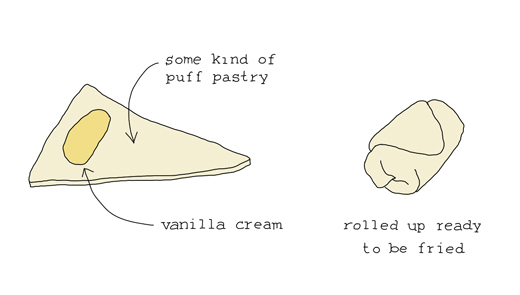 However my absolute favorite way, is to use the hat of the bun to scoop a mixture of cream and almond paste into my mouth, before biting into the rest of it’s loveliness. Happy Fat Tuesday everyone! Article about Semlor at Foodie Underground. The 13th of December is the day when Swedes celebrate Saint Lucia by lighting up the darkness with candles and crowns on their heads. 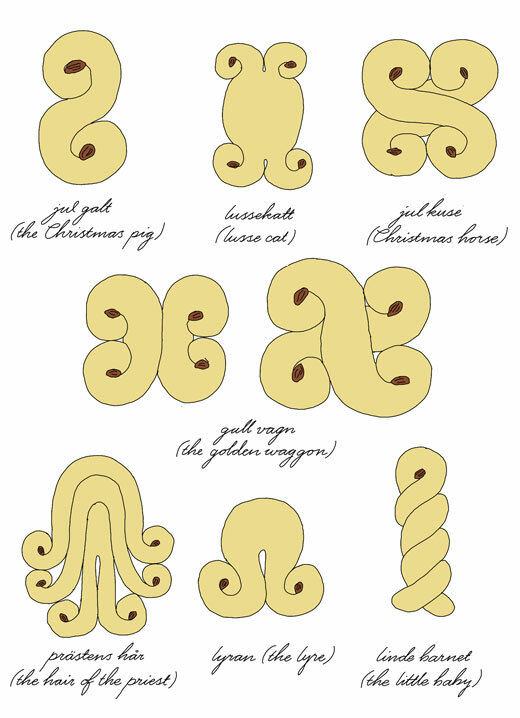 The Swedes also sing songs and eat funny shaped buns they call Lussebullar (Lussekatter, Saffron Buns). Even if Lucia’s day has already passed, anytime is ok to bake and enjoy these saffron rich buns. 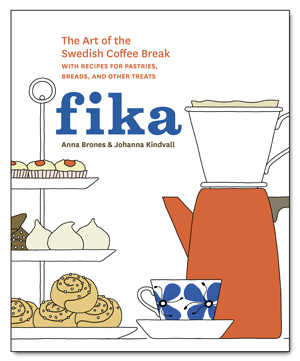 Below is Anna Brones’ recipe (updated and tweaked) from our book Fika. 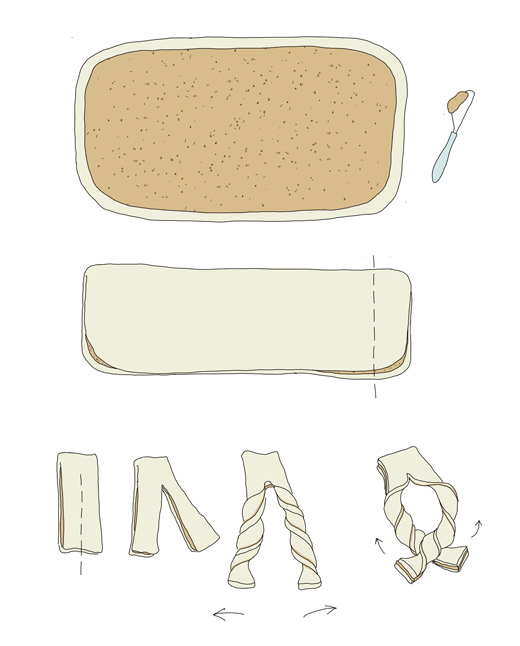 Please read Anna’s Lucia article over at Foodie Underground (with more illustrations by me). Using a spoon, crush the saffron in a small bowl. Then add a few drops of whiskey to help fully develop the saffron flavor and set aside. In a saucepan, melt the butter; then stir in the milk. Heat until warm to the touch (about 110ºF/43°C). 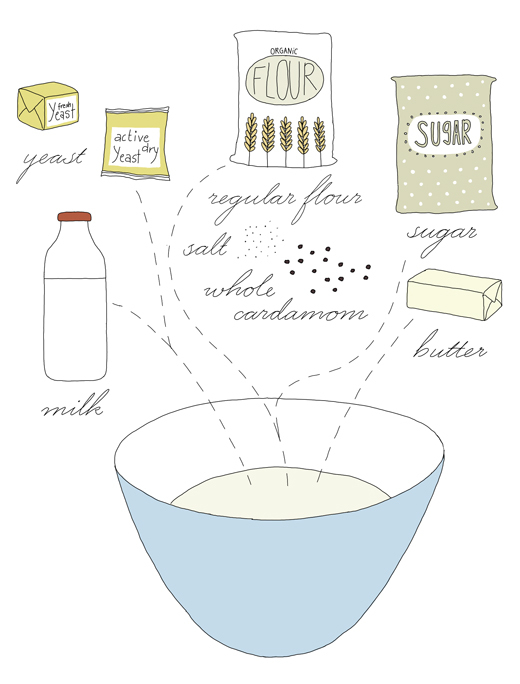 In a small bowl, dissolve the yeast in 2 to 3 tablespoons of the warm mixture. Stir and let sit for a few minutes until bubbles form on top of the yeast. In a large bowl, whisk 1 of the eggs and blend in the sugar and salt and the saffron mixture. Pour in the remaining butter and milk and stir until well blended. Mix in the flour and work together with a wooden spoon or your hands until well combined. Transfer the dough to the counter top or a flat surface and knead it until smooth and elastic, 3 to 5 minutes. The dough should feel a little wet, but if it sticks to your fingers and the counter top, add a little flour. Go lightly, though; if you add too much, the buns will end up dry. The dough is fully kneaded when you slice into it with a sharp knife and see small air bubbles throughout. Return the dough to the bowl, cover with a clean tea towel, and place in a draft-free place to rise until doubled in size, about 1 hour. Grease a baking sheet. 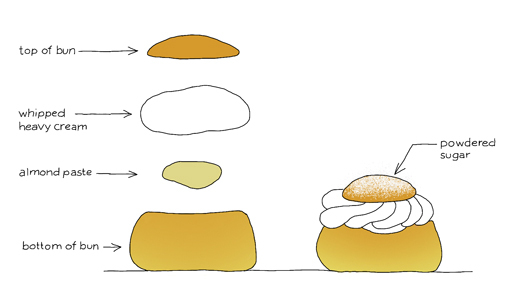 Remove the dough from the bowl and roll it into classic bun shapes (see diagram). Place the buns on the baking sheet with about 1 1/2 inches (4 centimeters) between each bun. Cover and let rise for 30 to 45 minutes. While the dough is rising, preheat the oven to 400°F (200°C). Bake for 8 to 10 minutes. Remove from the oven and transfer the buns from the baking sheet to the counter. Cover with a tea towel and let cool before serving. These buns dry out quickly, so if they are not eaten on the day you bake them, store them in the freezer. 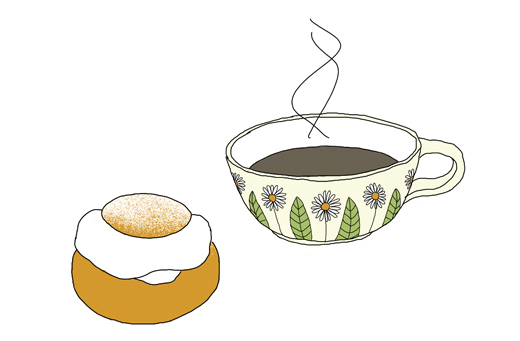 Yesterday was the day of Kanelbullen (the cinnamon bun) which Swedes celebrate by having ‘fika’ (a traditional coffee break in Sweden). 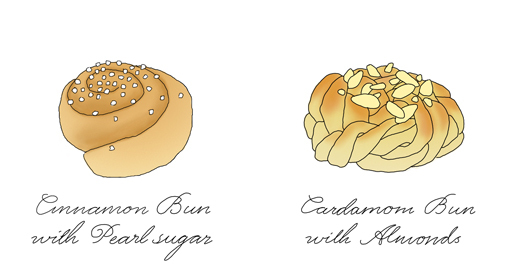 If you are as serious a bun eater as Anna Brones and myself, you will bake them yourself and have “fika” all day. Below is our last article together on EcoSalon. It may be the end of EcoSalon, but it will not be the last time you see something from Anna and me, our collaboration will continue one way or another. This article was 1st published at EcoSalon, 4 October 2012. The beauty of the Swedish cinnamon roll is in its versatility. Depending on your mood, you can switch out a few key ingredients for a completely different taste. Cardamom infused filling instead of the standard cinnamon and sugar mix for example (kardemummabullar).